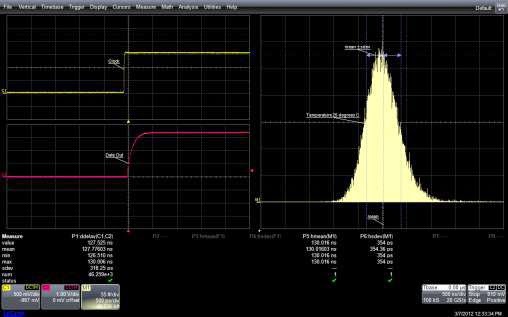 Many of Teledyne LeCroy's oscilloscopes are able to create statistical-analysis histograms on a very large number of measurements. The resulting data can be displayed as histograms, as trend plots (measurements in the order taken), or as track plots (measurements vs. time). As a result, the analysis capabilities of these instruments is extended to cover accurate readouts of up to 20 key statistical measurements such as mean, standard deviation, range, and many more. 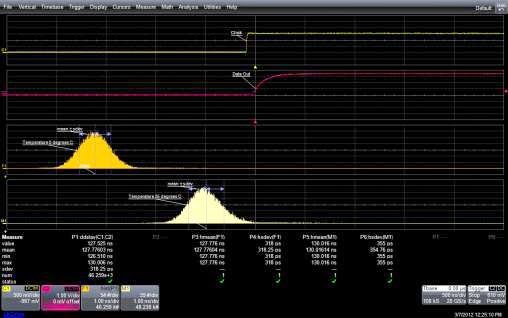 One way to use these capabilities of an oscilloscope is to characterize the specifications of a component. Suppose you needed to verify the propagation delay of a D-type flip flop at both room temperature and at 0°C. Figure 1 shows the setup while Figure 2 depicts a propagation-delay measurement performed at room temperature. In Figure 2, the upper left-hand trace (Ch1) is the clock. Below that is the Q output (Ch2), while the right-hand trace (M1) is the histogram of the delay between positive-going edges of the clock and the Q output. The histogram shows the distribution of over 46,000 individual measurements. Meanwhile, the statistical parameters, histogram mean, and histogram standard deviation, displayed below the waveform display, provide a quantitative measure of the histogram itself. This data can be stored for later comparison when the exercise is repeated at 0°C. The next set of measurements, taken at 0°C, appears in Figure 3. Trace M1 contains the data taken at 25°C earlier. Trace F1, which appears above trace M1, shows that the propagation delay taken at 0°C has shifted to a lower value. The average value, or mean, has shifted from 130 ns to 127.7 ns as shown in the statistical parameter readings. In addition, the shape of the distribution has narrowed as indicated by the decrease in standard deviation from 355 to 318 ps. This shows a reduction in the spread of the measurement values. These represent only two of the possible choices for the analysis of parameter values (see below for a complete list). Here, then, is an example of how histograms might be used to characterize component specifications under selected conditions. It's quite useful in cases where the component manufacturer has not characterized the device under specific conditions required by a given application. Moreover, you have the ability to display and compare data taken at different times and under different conditions.